The Pointe 400 building downtown offers two urban homeowners breathtaking views, abundant amenities and ample space 15 stories up. 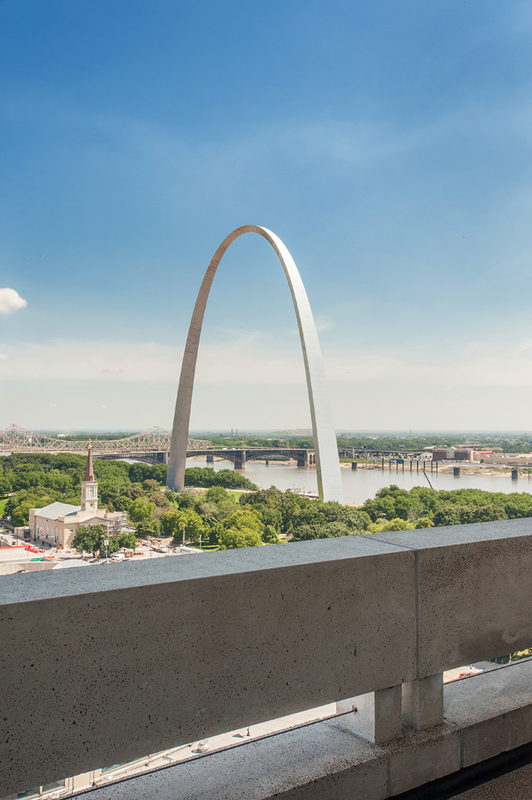 The Pointe 400 buidling offers sky-high views of the Arch and Mississippi River. 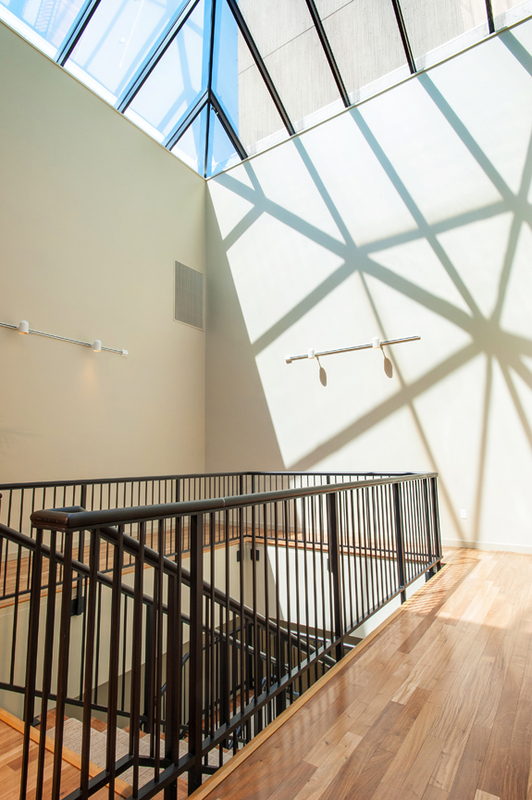 A two-story atrium skylight beams abundant amounts of natural light into the penthouse. 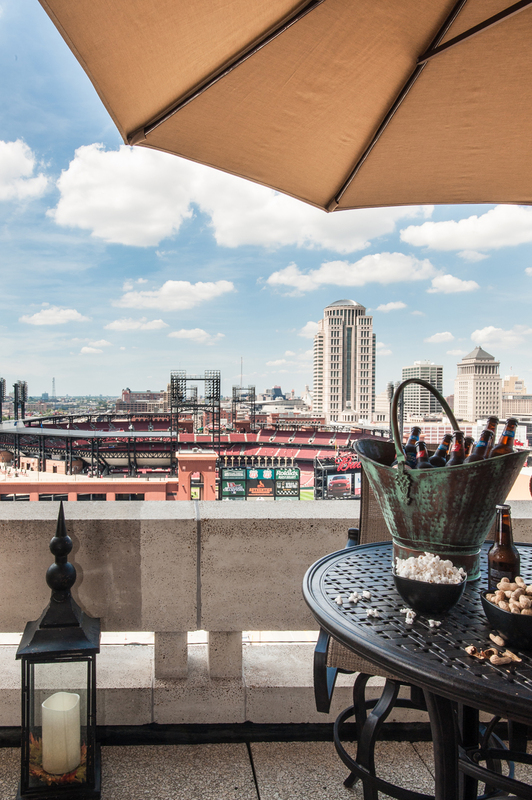 Matt's wraparound balcony provides a view directly into Busch Stadium on game days. The game room is a favorite hangout for Matt and guests. 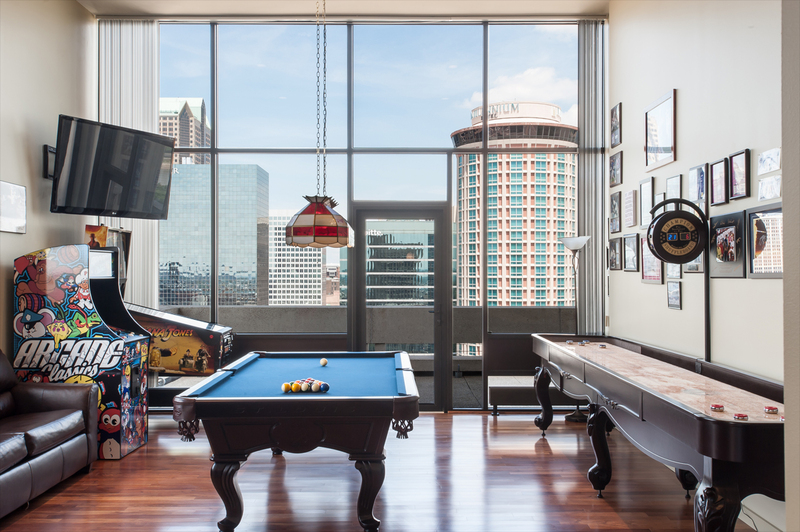 Complete with a pool table, shuffleboard table and arcade games from Aminis, its an ideal spot for entertaining. 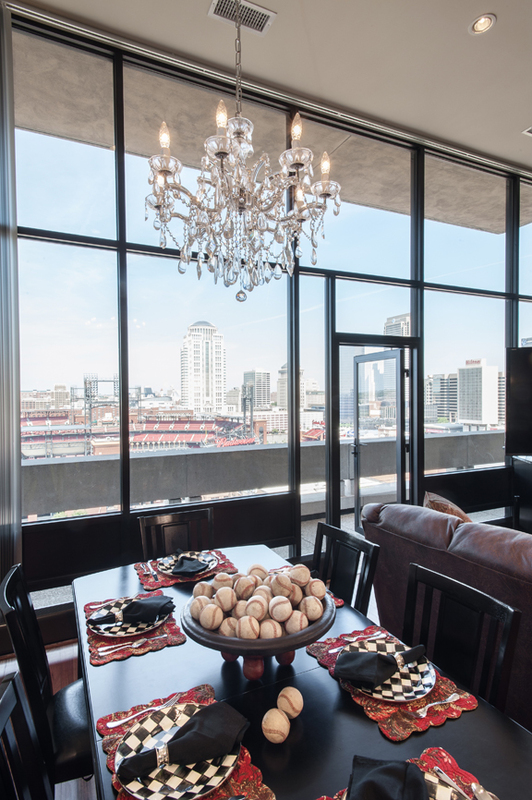 The dining room and living room area overlook Busch Stadium. With an affinity for entertaining, Matt has the perfect setup in his open kitchen, living room and dining room. A clean, white-leather sectional is softened by textured throws and pillows in soft animal prints. You can’t get more downtown than the Pointe 400 building. 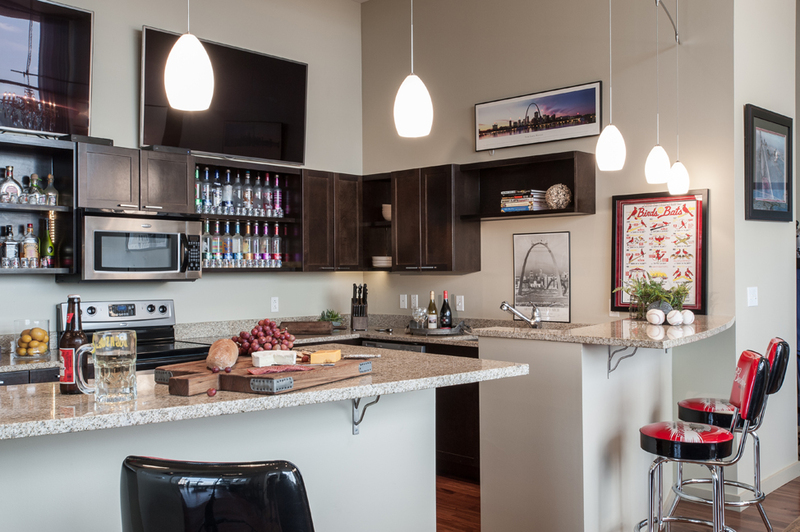 Situated along the Mississippi River and the Gateway Arch grounds, you are a stone's throw from Busch Stadium and the symbolic Gateway to the West. Immersed in the hustle and bustle of city living, urban dwellers are blocks from restaurants, shops, sporting venues and more. For two homeowners, living in downtown St. Louis was a no-brainer. Both Matt Matousek and Nicholas Karidis were drawn to the energy and vibrancy of downtown living. Each takes residence in a penthouse in the Pointe 400 building. Built in 1969, the building was previously home to Pet Inc., which produced Pet Evaporated Milk. Listed on the National Registry of Historic Places in 2004, the 15-story concrete wonder was eventually sold and developed into 118 luxury apartments. Residents, like Matt and Nicholas, experience the best of city living. Besides their spacious homes and astounding views, the men both enjoy the many other amenities the building has to offer, including a pool, hot tub, dog park, indoor garage parking, dry cleaning, car wash and car service. The lower level was kept as it was and converted into guest suites for residents of the building to rent for out-of-town family and friends. Matt, who is a general contractor and owns 220th Builders, transformed the top level into the ultimate sports fan's dream home. Since the top floor was lacking a bedroom and master bath, Matt first added a wall to close in the bedroom space, creating a master suite. Other renovations included adding a guest bath, complete with a shower and tub, as well as changing the configuration of the mechanical room to include a laundry room. New carpet was laid in the bedroom, and the carpet in the entry and office was removed and hardwood was added. What makes this unit every sports fan’s dream is the unbelievable view Matt has from his balcony. Sitting outside on his patio enjoying a frosty cold one, Matt and guests can see right into Busch Stadium. “You can see the crowd, hear the crowd as well as the fireworks,” Matt says. “I probably spend eight months out of the year out here.” It’s as if you are at the game without actually purchasing a ticket. For this reason, Matt says family and friends constantly are knocking on the door on game days to kick back and enjoy the Cardinals action from the comforts of Matt’s home. Matt loves to entertain, and the comfortable, welcoming ambiance of his home perfectly reflects his affinity for hosting. When guests are not outside taking in the game, you probably will find them showing off their own skills in the game room. Complete with a pool table, shuffleboard table and arcade games from Amini’s, there is no lack of amusement for guests. The walls are plastered with memorabilia from some of the greatest moments in sports history. An avid collector, Matt always is searching for his next great find, but he says he is an equal supporter of the Cardinals, Rams and Blues. In the kitchen, living room and dining room combined space, sports fans can watch a variety of games on one of the three TVs while enjoying beverages and snacks. A dining table, which seats six, looks out into the stadium, as does the oversized leather sectional. Relishing in the views, Matt can’t imagine residing anywhere else. Whether kicking back with a cold beer and a bag of popcorn watching the game or simply spending a quiet fall night breathing in the crisp autumnal air, Matt’s found his slice of perfection 13 stories in the sky. Previously in a smaller unit for two years, an opportunity arose for Niko to take over two units, knocking down a wall in between and creating nearly 4,000 square feet of living space. Combining the two units allowed for a much-needed third bedroom, guest bathroom and kitchen. The most stunning and attractive feature in Niko’s new residence is the two-story atrium, which beams abundant amounts of natural light throughout the unit. “The atrium is unbelievable,” Niko exclaims. “It lets in so much light, and at night it is really cool.” The plan is to make the atrium area into a gallery with three large pieces of art that Niko has yet to select. Not one to jump into purchase decisions, Niko gives each piece of art and furnishings careful thought. “My style is very eclectic,” he explains. “I don’t shop at box stores.” Many of the pieces in the residences have been purchased from Europe – Greece in particular. They remind Niko of his travels and cities he has lived in. In the open living room a clean, white-leather sectional is softened by textured throws and pillows in soft animal prints. The master bedroom continues the leather and animal-print trend with a black, printed and curved headboard and a hide-on-hair rug. While still a work in progress, Niko couldn’t be happier with his choice in residence. And that view… “It is a painting that is always changing,” he says.